It’s everything you expect from Chevy trucks and everything you didn’t expect from any small trucks. The 2015 Colorado will completely reinvent the midsize pickup. Built for a new generation with its own definition of adventure. It’s bold. It’s restless. It’s everything a truck should be, and more. The revived mid-sized truck won’t be available until Fall of 2014, but for now, we just can’t help but to keep looking at it. So what’s so special about it? A lot of things. 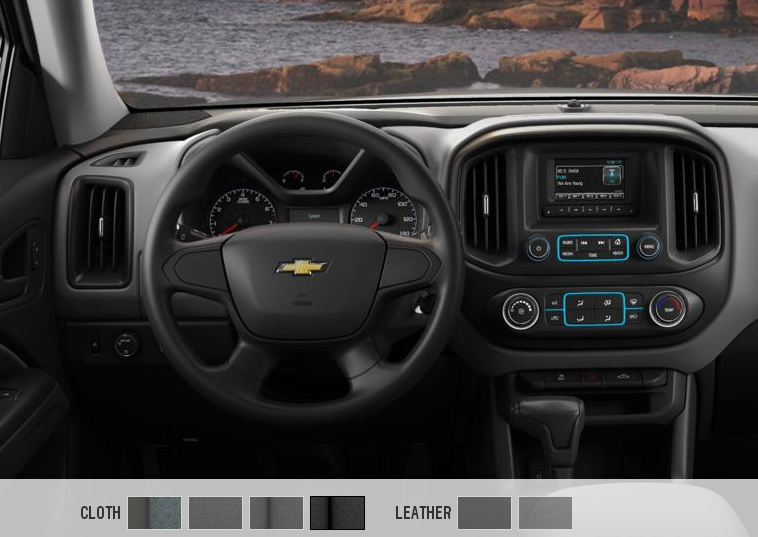 Inside: The 2015 Colorado will be the first in its class to combine design features such as inlaid, triple-sealed doors, and thick windshield and side glass to help reduce wind noise inside, which helps keep the commotion of the outside world right where it belongs. A huge center console will provide easy, secure storage for your gadgets. Cockpit-style gauges and large, simple controls combined form and function for intuitive operation. Seats are shaped for maximum support and leg room. And a sculpted headliner provides extra space for taller drivers and passengers. Under the Hood: The Colorado is, of course, engineered to achieve outstanding fuel economy. The 2.5 liter I-4 and 3.6 liter V6 engines will use advance technology to boost fuel efficiency without sacrificing performance. In both engines, Spark Ignition Direct Injection (SIDI) technology is utilized to optimize fuel economy. And joining the engine lineup the following year, the highly anticipated 2.8L Duramax Turbo-Diesel (which no other North American competitor in its class has offered before.) To enhance the unrivaled towing and payload, the Colorado available 6-speed automatic transmission features a button-activated Tow/Haul mode on 3.6L V6 models, which will help minimize upshifting and downshifting. 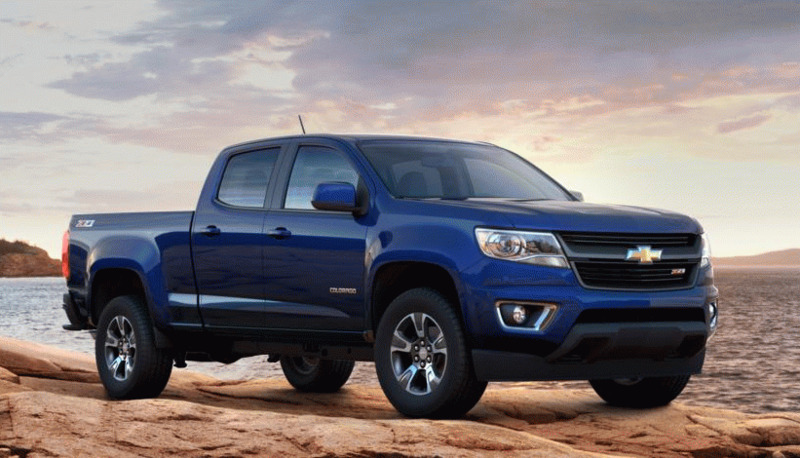 The Colorado will also allow you to have the option of the off-road Z71 package, of course. Outside: The Colorado will be available with in a Crew Cab or Extended Cab and offer the StabiliTrak Electronic Stability Control System and 4-wheel Duralife ABS brakes. And to help make your new Colorado yours, a bunch of custom accessories will be available to make the most of your time spent in your Colorado. A standard two-tier box system provides an upper and lower storage area, perfect for hauling mountain bikes on top while leaving plenty of room for more gear below. The available Cargo Management System divides the box into modular sections for amazing bed flexibility. And, for longer trips, you can get a dual rear-DVD entertainment system with wireless headphones to keep the rear passengers occupied and quiet. It’s got your back. And front. And sides… Colorado will include the 5-year/100,000-mile Powertrain Warranty, FREE 2-year/24,000-mile scheduled maintenance, and a 3-year/36,000-mile Bumper-to-Bumper Warranty. All this plus included Roadside Assistance and Courtesy Transportation programs for up to 5 years or 100,000 miles gives you the Best Pickup Coverage in America. Click here for more information on the Colorado from Chevrolet. 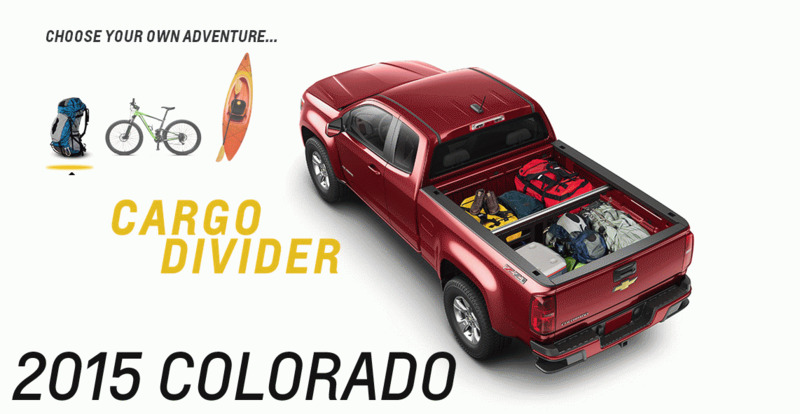 Stay tuned for more news on the 2015 Colorado and its arrival. If you want to be one of the first to know about its arrival at Jeff Gordon Chevrolet or want to pre-order one, simply call us at (888)261-0090 and we’ll add you to the list! Or you can simply email us at sales@jgchevy.com! OR (last one) just fill out the contact form below.